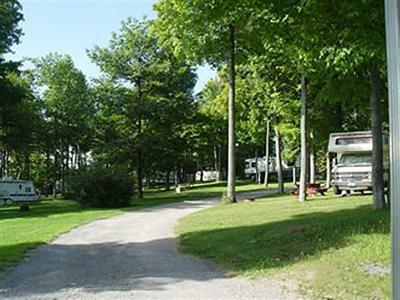 Shady Oaks RV Park provides all the comforts of home in Plattsburgh, New York, while you tour Plattsburgh, Montreal, Lake Champlain, Lake Placid and the Adirondack Mts! Shady Oaks has gone GREEN. Everything we can recycle, we do. Thinking about becoming a "Seasonal Camper". Spend your summers at Shady Oaks and your winters in the south. Great for "Snow Bird" retirees. Shady Oaks RV Park features 103 LARGE RV sites, either shady or sunny. Full hook-ups are available to all RV sites and include 20/30/50amp service. Sites have fire-rings and picnic tables. Firewood is for sale at the store.For fishing enthusiast it's only 2 miles to the nearest boat launch. For beach goers it's only 3/4 mile to City Beach on Lake Champlain. You can also enjoy a game of horseshoes, basketball and tetherball. 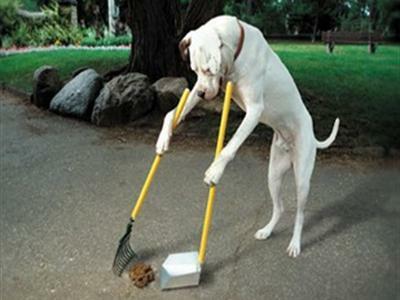 Pets welcomed on leash. 2 Pets allowed per site. Must present Rabies Shot Records at time of check in. For insurance purposes, all pets must be restrained while outside the camper trailer. In addition to the swimming pool, Shady Oaks RV Park also provides clean restrooms with showers, laundry room and banquet hall. There is also a camp store with limited necessities and RV supplies. Check e-mail messages from WiFi. 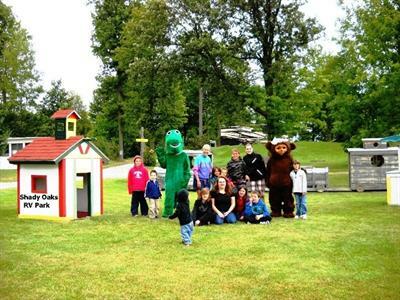 Children can enjoy a playground complete with a wooden train replica, fort, swings, slide, school and jail house. There is a swimming pool next to the pavilion. The Club House has a library and board games. Shady Oaks RV Park AMENITIES; Country setting, Full hook-ups, Water/Sewer/Electric (20/30/50amp), FREE WiFi located near the Club House. Cell phone availablity from campsite. Large grassy, shady or sunny sites, Swimming pool with Pavilion and deck. The Club House has a Banquet Hall, Laundromat. Bathrooms with Showers. Store/Office has some RV supplies. Incoming/outgoing mail. There is also Firewood for sale. The "CHAMP" Playground has a small train replica, a small schoolhouse and small jailhouse, large swings, fort with small slide, large slide, basketball hoop, tetherball and a horseshoe pit. Trash and Recycling dumpsters are provided. Picnic tables and fire rings are provided. NEARBY; Shady Oaks is only 1 quarter mile from I-87. 3 miles to all shopping malls, arcade games, movie theatre, historical City of Plattsburgh and golf courses. 1 mile to bowling alley and movie theatre with arcade games. 1 mile to City Beach on Lake Champlain. 2 miles to boat launch on Lake Champlain. 1 mile to gas station, convenience store and propane fill-up station. 1 mile to the Civic Center. Come Camp With Champ. Come play at the "Champ" playground. Champ roams the park. Watch out for the Champ Crossing Signs. You'll occasionally see dears, turkeys, groundhogs and farm cats throughout the park.